Complaint: Misdemeanor spelling of your own company’s name (multiple counts); Misdemeanor spelling of your own company’s name when the correct name is engraved nearby (multiple counts). Report: Officer was seated in the back of a New York City taxi cab when he noticed “Bumber Guards” sticker on the taxi compartment partition. Officer at first thought that the name was purposely misspelled, since no one could be that stupid. 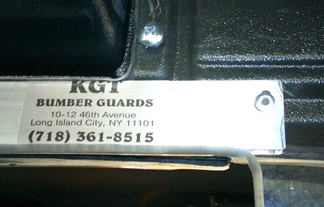 Officer then noticed the correctly spelled “KGT Bumper Guards” engraved into the partition not more that eight inches away. Realizing this was pure gold, he then took a photo which distracted the driver and got him yelled at.